The Education Ministry is set to launch a training program for 12th-grade high school students with the aim of turning them into computer hackers. Over the course of the program, scheduled to begin in the upcoming school year, students will be taught to hack into active computer systems in search of security breaches. The innovative pilot program will include 100 students within the framework of the prestigious software engineering track, in conjunction with the Israel National Cyber Directorate in the Prime Minister’s Office. The students will be trained by experts in the field and will ultimately be certified as “vulnerability analysts.” In other words, the students will learn to perform controlled cyberattacks on computer systems, including those that belong to schools, with the aim of detecting security weaknesses. The program is a sensitive one because the students could exploit the knowledge they acquire to hack government sites in Israel and abroad. Israeli youngsters have gotten in trouble in the past for hacking into the Pentagon and the U.S. military systems. Therefore, the course will place considerable emphasis on the topic of ethics and the students will be warned about permissible and prohibited conduct in the field. At the same time, 240 students in the teleprocessing track will be trained as “cyber protectors.” These students will be taught to detect cyberattacks and to inoculate computers systems accordingly (in contrast to the vulnerability analysts who will be taught to breach systems). To graduate from the course, the students will be required to analyze their schools’ cybersecurity systems, which contain sensitive information such as grades and personal files, identify vulnerabilities and recommend solutions to prevent information leaks. The purpose of the program is to develop reserves of trained manpower in the field of cyber and information security. The expectation is that these students will put the skills they learn in this course to use in the workforce after they graduate. 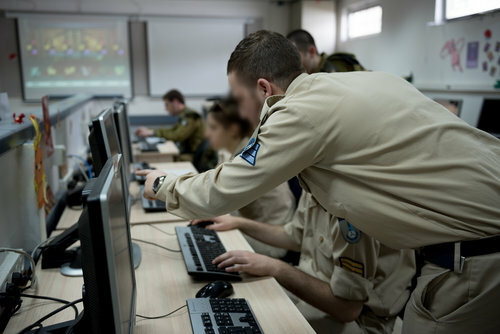 “For the first time, students in the education system will receive the tools to defend the State of Israel online,” Education Minister Naftali Bennett remarked. “One of the greatest threats today isn’t necessarily military in nature, but rather digital. All the systems we use are controlled by computers; therefore hacking them for classified information means real harm to Israel’s ability to function,” he said. “Israel’s cyber warriors will stand in the same line alongside Sayeret Matkal [the IDF’s elite special forces unit], Golani [infantry brigade] fighters and Artillery Corps gunners. They are the tip of the spear on the modern battlefield, and I trust them to courageously defend those assets that belong to all of us,” Bennett added. Next articleYid Parenting: What’s Wrong With Screen Time?